It is hard to believe that it is already Week 11. The NFL season really goes amazingly quickly. It seems like it was just yesterday that Randy Moss was leaving his first team, and we were writing about the effects that Moss would have on the Vikings. Needless to say, we did not pick “fracture the team further, make the team turn against the coach and get dumped away three weeks later” as Moss’ “effect.” Anyway, let’s go to the matchups for Week 11. Another year, another Pats/Colts game. For the first time since 2006, the game is in New England, which allows the team with the highest average ticket price to pay even more for the NFL’s marquee matchup. This version of the game doesn’t have as much buzz as usual, which is probably due to the fact that the Colts are massively injured, and might be shorthanded. However, even without the normal buzz, the Pats and Colts are still the hottest ticket in the NFL (well, except for those two Saints games). I’m not surprised that it isn’t in first (since no one was going to beat Pats/Colts this week), but it is surprising that the Giants @ Eagles Sunday Night game does not have an average price over $200. Both teams are tied for the lead in the NFC East, and Michael Vick and the Eagles’ are the talk of the league. It should be a great game, and there might be some great deals to be had. 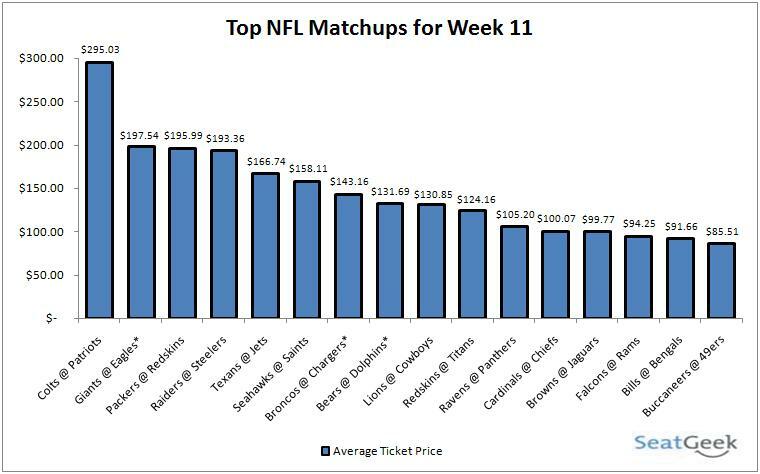 The Raiders @ Steelers matchup is probably the most expensive game involving the Raiders in years. It is so good that this matchup means something for the first time since their meeting in Week 2 of the 2002 season. This was THE matchup of the NFL in the 1970’s, when the Raiders were in their heyday, and the Steel Curtain ruled Three Rivers Stadium. The Raiders and Steelers are one of the best matchups through the course of NFL history, and it looks like it might be back on. It looks like one win is not enough to win over the Cowboys’ fans. Their home game against the Lions, with an average price of $130.85, is higher than their last home game against the Jaguars, but not by much. Despite the new energy that Jason Garrett gave their fanbase, and their resounding win over the rival Giants, the prices haven’t risen that much. What is the most surprisingly priced game? I vote for the Browns @ Jaguars game. The Jaguars are again behind the 8-ball to sell the game out, but the average price is up to $99.77, which is higher than three other games. The Browns are not a great draw (that 3-6 record doesn’t help), and the Jaguars had lower prices when hosting worse teams. This might be a sign that the fans believe. Week 11 should be fun. There is the renewal of a once dormant rivalry in the Raiders @ Steelers. There is an enticing Sunday Night matchup between two teams tied for the NFC East lead. Finally, there is that good ol’ Colts @ Pats game. The rivalry of the decade will be renewed around 4:15 pm on Sunday in Foxboro, and millions will watch. Don’t be one of those people who miss out, because as good as they are, there may not be many more years of Brady vs Manning left. Enjoy the games this weekend. Thoughts or comments? Leave one here or hit us up on twitter (@SeatGeek). See a price you liked? Get up to the main site, seatgeek.com, and check out a game. ‘Till Next Time.